Section 9.36 of the National Building Code details new requirements for housing and small buildings that is focused on improving the energy efficiency and reduction of greenhouse gas emissions. The code references six climate zones. 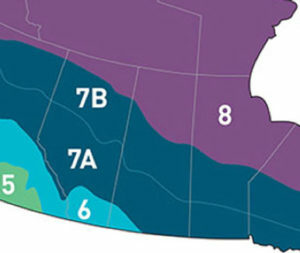 The prairies have four of these zones. The specific weather location may be determined by referencing Appendix C of Division B in the Code or by consulting the local authority. Energy Code 9.36 includes three paths for compliance; Prescriptive, Trade-Off, and Performance Compliance. Select only one compliance path; multiple compliance paths are not permitted on a single building. Prescriptive Path – The acceptable level of building energy efficiency by constructing the minimum requirements. This path involves following the prescriptive requirements of Subsection 9.36.2, 9.36.3 and 9.36.4 and is typically the simplest compliance path. It involves meeting all requirements in that part, but might not be appropriate for all buildings. Prescriptive / Trade off Path – The acceptable level achieved by swapping of one or more building envelope thermal performance requirements, resulting in no worse thermal performance than if the affected assemblies met prescriptive requirements. If you need more flexibility in your design, a trade-off path allows you to trade elements within the above ground building envelope to demonstrate an equivalent level of performance without meeting every prescriptive requirement. Performance Path – The acceptable level by employing a computer simulation software or calculations to compare a proposed design with a hypothetical reference building to show that the proposed design will use less energy over the course of an operational year. Once construction of the house is complete, a blower door test is performed and a Natural Resources Canada EnerGuide Rating System label is issued. How do windows and door fit into Energy Code 9.36? The Code allows windows and doors to qualify under two different energy performance rating methods: by the total unit U-value, and by Energy Rating (ER). The U-value is the rate of heat loss through windows under standardized winter conditions and does not take solar heat gain into account. The ER is an overall energy balance rating that takes account of passive solar heat gain in addition to heat loss. The ER is intended for use in homes with average window-to-wall ratios, and an approximately even distribution of windows on all sides of the home, and no external window shading devices. In such homes it has been shown to be more effective for selecting windows for lowest year round energy use. The ER is not recommended for homes with higher window-to-wall ratios (above 30%), or with windows facing primarily one or two orientations. Under these conditions occupants could face heating discomfort, or fail to obtain the benefits of moderate passive solar heat gain. For homes with high window to wall ratios, or windows primarily facing one or two orientations, windows should be selected on the basis of U-value, and with consideration to reduce occupant discomfort from excessive solar heat gain by use of external shading or glass with lower solar heat gain. There is some flexibility that allows trade-offs, in which a better performing window or glass door can compensate for a worse-performing product having the same orientation. It also has a performance path, and it is possible that homes designed under the performance path could accommodate several products that have worse than prescriptive ratings. The code also relaxes the U-value requirement for one door in a home. The intent is to allow decorative or heritage style entrance doors to be used which might be constructed of materials that cannot achieve the prescriptive U-values. This table provides the maximum U-value and minimum Energy Rating for your building zone. The code requires products to be labeled with energy performance ratings. This ensure your windows or doors comply with the energy requirements based on your site location.